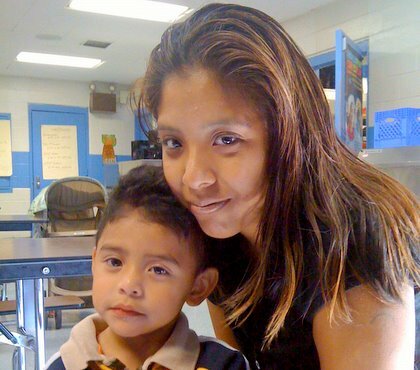 Above: Engaged parents, such as PTO President Carina Arriaga (shown here with son, Alan), are a key ingredient in Wolfe Street Academy’s success. As soon as the crossing guard says so, a sea of children wearing blue polo shirts moves quickly across Lombard Street. It’s Wednesday, the early morning sun is warm and kids are running, with their new backpacks bouncing, into Wolfe Street Academy, a Pre-Kindergarten through fifth grade school in Upper Fells Point. The school’s principal, Mark Gaither, greets them in the cafeteria, which also doubles as a gathering area for their morning meetings. The students sit at the tables and sleepily sip milk while their parents stand against the walls, chatting with one another. Straightening his tie, Gaither bellows good morning into a hand-held microphone. Everyone roars back. And after making announcements about planning for an upcoming Halloween party and praising school-wide test scores, Gaither dips his head and is silent for a moment. It’s not all that’s being done better at Wolfe Street Academy. A traditional school since 1852, Wolfe Street had been on the school improvement list for several years during the 1990s and early 2000s. If it continued on that course, Wolfe Street would have most likely ended up another low-performing city school. But in the last five years, the school, under its new leadership as a public charter and with a supportive, mostly Latino community, test scores are up, new programs have started successfully, and students are thriving in a changing neighborhood. When Gaither arrived five years ago, only 40 percent of students could read or do math at the proficient or advanced level, according to the Maryland School Assessment. This past year, that number has stood at 89 percent. This includes all children — English Language Learners (ELLs), Special Education students, minorities and the poor. About 65 percent of the students at Wolfe Street are Latino. Growing up in Baltimore city and the son of the former superintendent of the Philadelphia Public School system, Mark Gaither started teaching in 1990, mostly at Quaker schools in Philadelphia. With a degree in history and Latin American studies from Haverford, he tried to figure out new ways to implement better programs into multi-ethnic schools. In 2005, Gaither came to Wolfe Street as principal and began pushing for charter status. Gaither was able to get 100 percent of the faculty and 70 percent of their parents behind it and, at the Baltimore City School Board meeting to vote it as a charter, everyone from Wolfe Street filled the room wearing red T-shirts. That show of support was very important in the approval process, Gaither recalls. The school is now part of a network of charters in the city and is included in a zone that stretches from Harbor East to Greektown. The conversation about public charter schools is one that will continue to be at the forefront of education reform. The recent opening of the charter-friendly film, “Waiting for Superman,” and the push for new charter legislation by both the Obama administration and Former Gov. Robert Ehrlich, hints at the expansion of the movement, both nationally and locally. Gaither says that although the jump to a public charter for Wolfe has felt successful, charters on the whole are not the salvation of public education. But, in general, most students in the upper grades at Wolfe Street have a fairly good practical use of English, but need work on fluency, comprehension and vocabulary. “Academic English, the English used in the classroom, is very different from social English,” he said. All instruction is in English but about 15 to 20 percent of the educational staff have a functional use of Spanish, Gaither said. “Occasionally a teacher will flip into Spanish to give a student who is predominantly a Spanish speaker a quick definition or explanation but then they are right back to English,” he said. The staff tries to weave the work students do in ESOL class into the reading and math, which in turn supports the learning in art and music. “If we didn’t strive for this much integration there would not be enough minutes in the day to do what we need to.,” he said. Gaither is proud of the school’s conversion to a charter and the fact that if a child moves within their enrollment zone today, “he’ll have a seat here tomorrow.” But he’s mostly proud of the family involvement that has grown over the last several years, particularly with Latino families in Upper Fells Point. As the Latino population continues to grow in the area, so do the number of students at Wolfe Street. This raises its own set of challenges, Gaither says. It means that ESL services need to be used regularly and strategically. Using translators, parent-teacher meetings take twice as long. And on the days when rumors of a recent deportation sweep the neighborhood, student attendance drops, Gaither says, from 90 percent to a staggering 45 percent. And especially after this past summer, when five Latinos in East Baltimore, all of them Honduran, were attacked in suspected hate crimes, the community is afraid to draw attention to itself. Nowhere is hopefulness more clear than at Wednesday’s morning meeting. The cafeteria is packed and after Gaither’s announcements, the students file out to class while he critiques the way they form their lines: they cross their arms and put a finger to their lips, without making the “shhhh” sound. Their parents clean the garbage from the tables and take a seat, readying themselves for speeches from candidates for PTO president. Three women – Carina Arriaga, Caterina Gonzalez and Maria Rodriguez – step up and give quick speeches, highlighting their desire to be more involved with the school and support the community. There is applause all around and voting forms, printed on small green pieces of paper are passed from table to table. Connie Phelps, the community schools coordinator, points around the room. Watching out the cafeteria door for a bus to bring her to her GED class, Carina Arriaga fills a form out with a magic marker and bounces her youngest son, Alan, on her knee. “Is it even okay to vote for myself?” she laughs. Arriaga has four kids in the school, her oldest in third grade. She went through the Baltimore school system and sees the growing Latino community in the city as an asset to the school. In 2015, Wolfe Street will renew its charter for another five years. “That will be a decade of meeting standards!” Gaither says, looking confidently ahead.